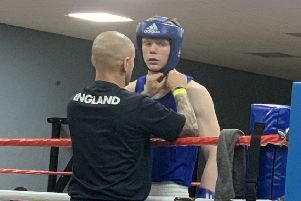 Luton boxer Kay Prosper believes he has what it takes to step up to the big occasion when he fights on the David Haye undercard at the O2 Arena on Saturday. Prosper, 31, will have only his seventh professional bout against Lee Connelly, on undoubtedly the biggest night of his boxing life, sharing the same stage as Haye’s comeback clash with Mark de Mori. Speaking to the News/Gazette, he said: “It’s like a dream come true. I’ve been boxing at York Hall, which is a special venue, but stepping up to this venue, it’s hard to fathom. “I’ve never been there yet, on Friday I’m going to go to David’s weigh-in and will get to see it then. “I know it’s going to be a big crowd, on TV, so it’s a really great opportunity. “I think the whole environment and atmosphere will get the best out of me. “I don’t think I’ll be fazed by it, I think I’ll relish it, make the most of it and try to really put on a show. “It’s something I’m going to have to make the most of, there are now other avenues and different opportunities to get my name out there, so people can know I’m the real deal, not just in it for the fun of it. “People know I want to push on and have a great career and be successful and show people what I’m about. Prosper only recently signed with Goodwin Promotions at the back end of last year and is already reaping the benefits of the switch to pair up promoter Steve Goodwin. He continued: “I’ve only been with him just before Christmas and for him to put me on his show, out of all his boxers, he’s picked me. He’s got a lot of fighters, around 100 fighters, so I think he really does believe in me, and wants to push me on. On his final preparations for the bout, Prosper added: “It’s more about keeping everything sharp now, working on our gameplan, our strategies.